What is the core concept of SINR or SNR model? As we all know, there is a relationship between SINR or SNR and BER. Specifically, when SINR/SNR is higher, the BER is lower. And there are lots of work on modeling the complex SINR/SNR. Analogous to the SNR used often in wired communications systems, the SINR is defined as the power of a certain signal of interest divided by the sum of the interference power (from all the other interfering signals) and the power of some background noise. If the power of noise term is zero, then the SINR reduces to the signal-to-interference ratio (SIR). two of them are from the wiki. While, there is still a question that "What is the core concept of SINR/SNR?" It is clear that when the signal is higher than the interference plus the noise, the probability of decoding signal successfully is higher. But, what is the root component that supports this? Until now, the "Capture Effect" is the only concept that I found can explain this. The capture effect is defined as the complete suppression of the weaker signal at the receiver limiter (if it has one) where the weaker signal is not amplified, but attenuated. When both signals are nearly equal in strength, or are fading independently, the receiver may switch from one to the other and exhibit picket fencing. This is the description from the wiki. Capture effect Specifically, the limiter at receiver works for it and it can explain the SINR/SNR to BER correspondingly. But I am not sure whether it is the exact reason for the SINR/SNR model. well, there is another question in my mind just now: what is the basic/general technology for wireless system to combat the interference? Besides the SINR/SNR model (or the relative power model)? 1.What is the core concept of SINR/SNR? 2.what is the basic/general technology for wireless system to combat the interference? Talking about digital; first SNR, then interference. The core-concept so to speak for SNR (signal-to-noise ratio) is simply a measure of how much signal you have relative to your noise -- that's all. For example, on an Internet forum with very little moderation where bad posts are allowed to stick around (note: absolutely not calling out anyone here, this is more for humor), you may have a lot of 'noisy' posts crowding out the posts full of useful information. Similarly, if you have a signal you're sending over some communication channel, and then you apply AWGN (additive white Gaussian noise) to it, if you apply too much noise to that signal, it may be impossible to recover it. Additional "noise" sources could be Doppler shift, fading effects, path loss, etc. A related concept to SNR is Eb/No, or energy per bit to noise-power spectral density ratio. Grossly simplified, one could consider this as how much energy you are shoving into each bit. This will come into play below talking about modulation. Speaking of bits, let's talk modulation schemes. There's a litany of acronyms -- FSK, MSK, OOK, PSK, QAM, BSK, etc. Simply put, these are all ways of talking a signal / data (i.e. 1010 1010), modulating some carrier wave in some fashion, and then transmitting that modulated signal over your channel. After the channel, the receiver must demodulate this signal. A modulator well generate symbols for transmission. One measure of performance is BER, or bit-error rate. Simply put, this is measuring how many of your bits made it correctly over your channel. 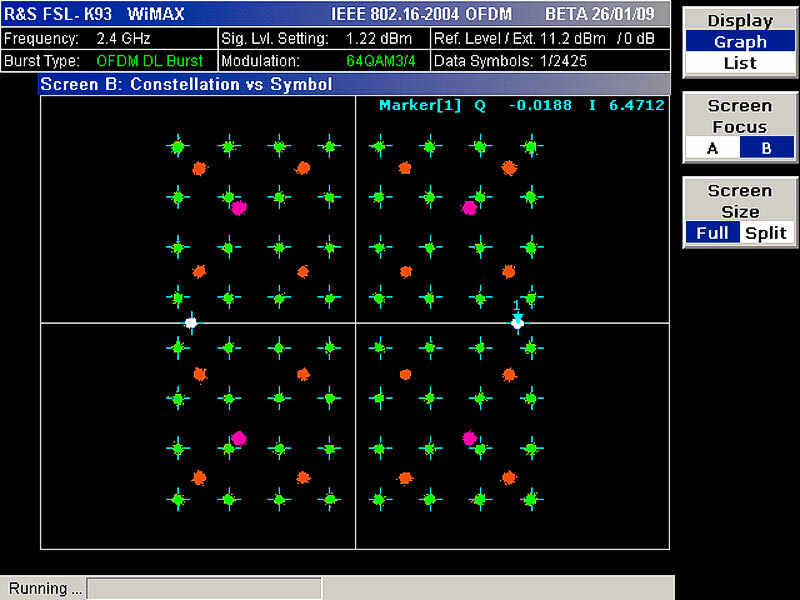 Certain modulation schemes can deliver excellent BER performance compared to others; for example, if we just look at QAM, which FakeMoustache posted, you'll see that the signal energy is spread out over the constellation, and symbols at the far ends will have less Es (energy per symbol) than the ones closer to the middle. That scheme can push a lot of data, but compared to something simple like QPSK, where it's simply four equidistant points, it may be less tolerant to errors due to channel. A quick example is QAM -- quadrature amplitude moduation. This is a coherent modulation schemes (must have phase knowledge) that is commonly used in both wireless and wired communication. Your average HDTV / cable systems utilize 256-QAM; some powerline networking products in your home utilize 1024 or even 4096 QAM. It all is dependent on what channel you're going to send it over; relatively low-noise, reliable copper-wiring, or a noisy, lossy free-space channel from the top of a mountain to a nearby city. One could also perform Monte Carlo simulations to attain experimental results, but these close-formed expressions utilizing Q Functions can be leveraged to generate some quick simulated graphs to compare performance. As with all of engineering, modulation schemes are an exercise in compromise. Some may deliver an excellent BER at the expensive of requiring a powerful, highly complex receiver device. Others may be really good at data throughput, but awful resistance to interference. An engineer could try to fight noise problems by increasing transmit power, but that comes at the cost of money, power and size. He could try to use a more advanced scheme at the expense of a complex receiver that requires CSI (Channel State information). Increase system 'smarts' w/ cognitive radio-like behavior, pilot signals, etc. This is a really fast summary of a very complex field of EE that's responsible for a lot of the advances we take for granted today. If you're interested in more, the area you want to focus is Communication Systems / Wireless Communications. MIT OpenCourseWare has some decent courses on this, and in terms of book, Molisch is excellent, as is Tse's book. tl;dr -- in a sentence, I'd say SNR is a metric to tell you how much of what you have is actually what you wanted in the first place. There are many ways to improve that ranging from hardware to software to mathematical. 1) I do not think that there is a different "root cause" for a higher SNR or SINR giving better BER than the simple fact that for a given modulation a certain SNR at the decoder input must be realized. As the difference between the wanted signal and the unwanted signals (interferers and/or noise) get smaller it will be more difficult to detect the information that is in the wanted signal. will be smaller making it harder to distinguish a one from a zero. For more complex modulations like OFDM, when the SNR decreases, the points in the constellation diagram become "clouds" instead of sharp points and more errors are made. It is obvious that a 4 point constellation diagram is more robust (can handle more noise) than a 64 point constellation diagram. one could switch back to 16 bit QAM to allow for more noise but at the cost of bandwidth (less bits per second). For example Wireless LAN (Wifi) does this. Or you could use a different channel or keep changing channels all the time (Bluetooth does that). Or transmit at a higher power, this increases the signal but the noise should stay the same. Or you could use a better (more directional or larger) antenna. Or you coul move to a location where there is less interference. Most people know that you can improve a bad cellphone connection by going outside or near a window. Or a combination of any of the suggestions above. Not the answer you're looking for? 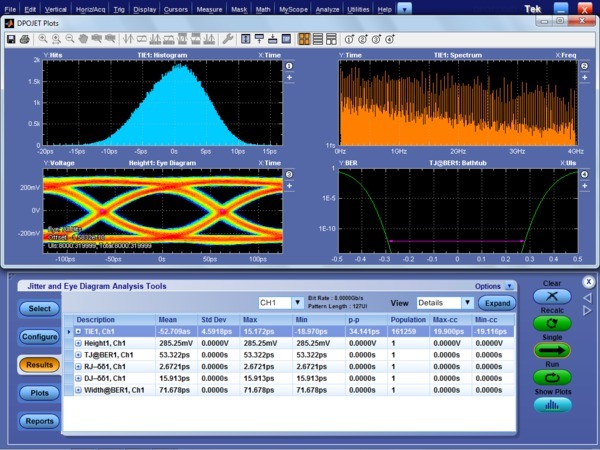 Browse other questions tagged interference signal-to-noise or ask your own question.